IMGC2019 will be held at in Strasbourg, France, September 25-28, 2019. We hope you will plan to join us for another exciting IMGC! Please see https://imgc2019.sciencesconf.org/ for details! The International Mammalian Genome Society (IMGS) is pleased to announce the establishment of a new award in honor of Dr. Mary Frances Lyon. Dr. Lyon was a founding member of the IMGS and remained active in the society through 2008. She began her scientific career at Girton College of the University of Cambridge in 1943, with Zoology as her main area of study. At that time, less than 10% of students were women, and women were awarded only “titular” degrees. Dr. Lyon subsequently secured a post-graduate degree position with Dr. R.A. Fisher at Cambridge, which was completed at the University of Edinburgh under the direction of Dr. Douglas Falconer. Dr. Lyon then took a position with Dr. T.C. Carter, working on a project funded by the Medical Research Council (MRC) to use the mouse to study radiation mutagenesis. She moved to Harwell with Carter in 1955, remaining there until she retired. While Dr. Lyon is perhaps best remembered for her ground-breaking 1961 paper in the journal Nature which first described the random inactivation of the X-chromosome in female eutherian mammals, her involvement in mutagenesis projects and her interest in embryogenesis led to additional important advances in genetics. Dr. Lyon also made significant contributions to the mouse genetics community as editor of Mouse News Letter, chair of the Committee on Standardized Genetic Nomenclature for Mice, and was a great supporter and mentor of mouse geneticists early in their careers. In recognition of Dr. Mary Lyon’s role as a mentor and her remarkable career, begun at a time when very few women became scientists, the IMGS has established the Mary Lyon Award for early-stage independent female researchers (tenure-track Assistant Professor or equivalent). The IMGS will cover expenses for awardees to participate in an International Mammalian Genome Conference and give an oral presentation of their work. Nominations, including the name of the nominee, their email address, CV or Orcid ID, and the name of one individual who can provide a recommendation letter, should be sent to imgsgeneral@gmail.com. Note that nominees need to be IMGS members, but can join at the time of the nomination. Self-nominations are welcome. While nominations can be sent at any time, the deadline for nominations for the International Mammalian Genome Conference in Puerto Rico, November 11-14, 2018 is APRIL 15, 2018. The International Mammalian Genome Society exists primarily to foster and stimulate research in mammalian genetics from sequencing and functional genomics to mutagenesis and mutant analysis, and to represent the concerns of its members in their professional activities. 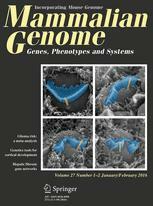 The activities of the society have expanded with the growing realization of the important and unique role of rodent species in current biomedical and genetic research. The extensive mouse genetic resources and the identification of evolutionary conserved linkage relationships between mice and humans offer significant opportunities for understanding gene function in relation to human development and disease. The role of the mouse in biomedical and genetic research continues to expand as the benefits of comparative sequence analysis of the human and mouse genomes and large scale mutagenesis programs are obtained. The roles of other mammalian organisms will expand as their genomes are sequenced. The official journal of the IMGS! As a member of the international scientific community, the International Mammalian Genome Society (IMGS) encourages efforts to recognize the importance of scientific research and education. The MARCH for SCIENCE will be held at sites around the globe on April 14, 2018. Through this public display of support, we hope to encourage world leaders to acknowledge the value of science and provide robust funding for openly communicated and unbiased scientific research. Such funding is essential for spurring the innovation and advancements needed to improve personal health and benefit society and the planet as a whole. MARCH for SCIENCE events will take place worldwide on April 14, 2018. The IMGS urges members and non-members, scientists and non-scientists alike to participate in this forum in their community, as well as to be vocal advocates for science and evidence-based policies everyday. Science affects everyone-whether it is medical research which influences health care decisions or research that helps provide clean water to third world countries, we are ALL influenced. Join us in making the March for Science a historic event in support of science!